I was recently asked to teach Google Sheets to 7th graders in Digital Literacy Class in one 50 minute block. The challenge of being at a school one day a week. There is so much to Google Sheets, I wasn't sure where to begin so I asked math and science teachers at both the middle school and high school what were the most important skills they wished students knew about spreadsheets. What I learned is that students do not seem to have received any formal spreadsheet instruction and are entering classes at the high school unprepared. The teachers listed everything from entering data, basic formatting to creating formulas and building graphs. While I am comfortable with Sheets from my prior life as an underwriter and financial analyst, I wanted some guidance to help me teach. I found a great resources on Teachers Pay Teachers by Cluney's Classroom. It is one of the pricier items at $23.99. But it was well worth the amount of time I would have had to take to create from scratch. Since it is March and we live in Connecticut, I decided to use the Basketball Sheets Lessons from TPT. I changed the data from the TPT lesson and used UCONN men's basketball 2016-2017 statistics (see attached PDF - stats were downloaded February 24, 2017). To make the most to my 50 minutes I created the video below for the teacher to show students prior to my "in person" lesson. This video introduces Sheets with some basic vocabulary, how to enter data, format cells. It is not perfect but it was the best way I could think of to make the most of the 50 "live minutes." My live lesson follows the TPT Basketball lesson plan. The TPT lesson also provides ideas for independent student work to assess understanding. I will follow up post lesson with reflections soon! 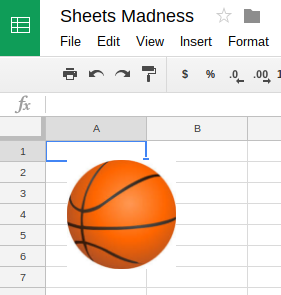 Cluney's Classroom Sheets Sheets Madness spreadsheets.